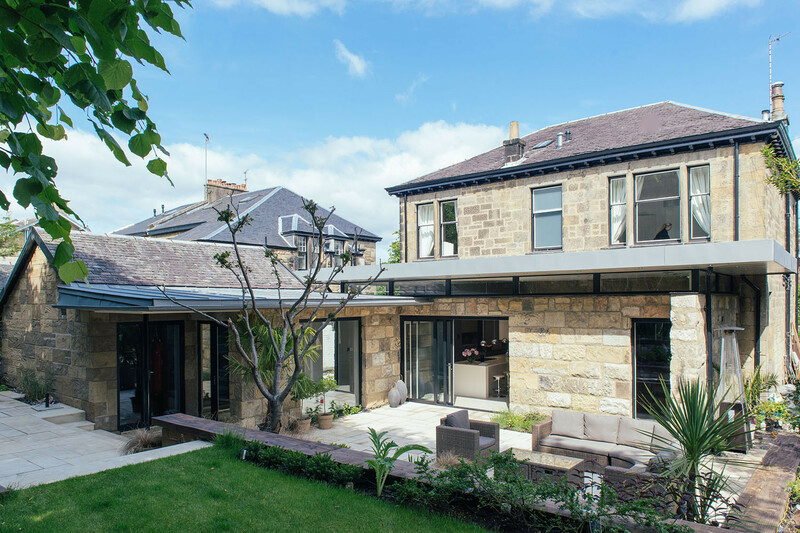 It was important to work closely with the architects Ellson Buchanan to create a kitchen design that was in keeping with their vision for the extension. 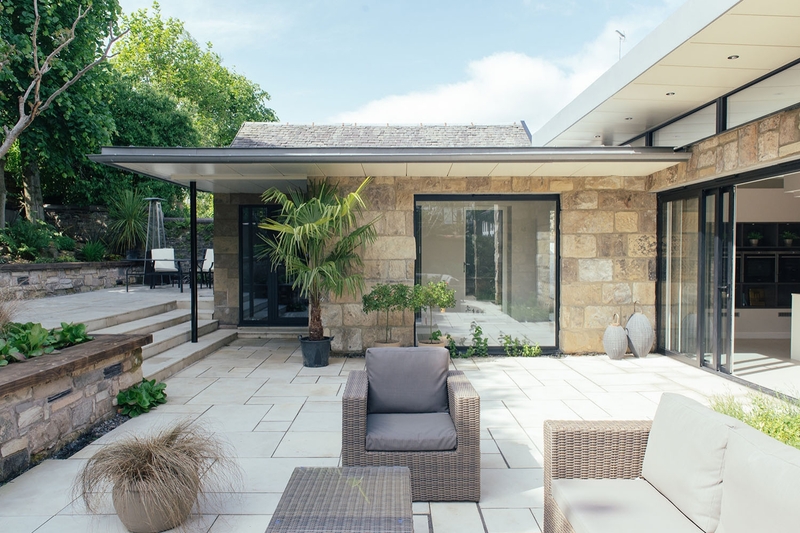 The entire L-shape of the new extension was to include the kitchen, a comfortable dining area and a living room. Mrs Beer wanted the kitchen to feel part of the whole space, not tucked away in the corner. With such a lovely large space to work with we decided to work in two islands to the design, one for food preparation and one for cooking. The property is a traditional Victorian blonde sandstone detached villa with many period and original features retained within. 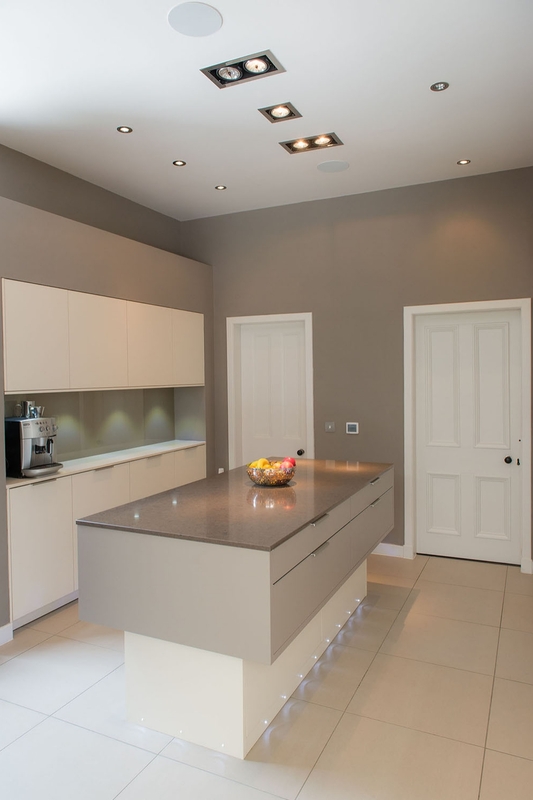 Our clients sought to refurbish the property to create a contemporary home for their family. 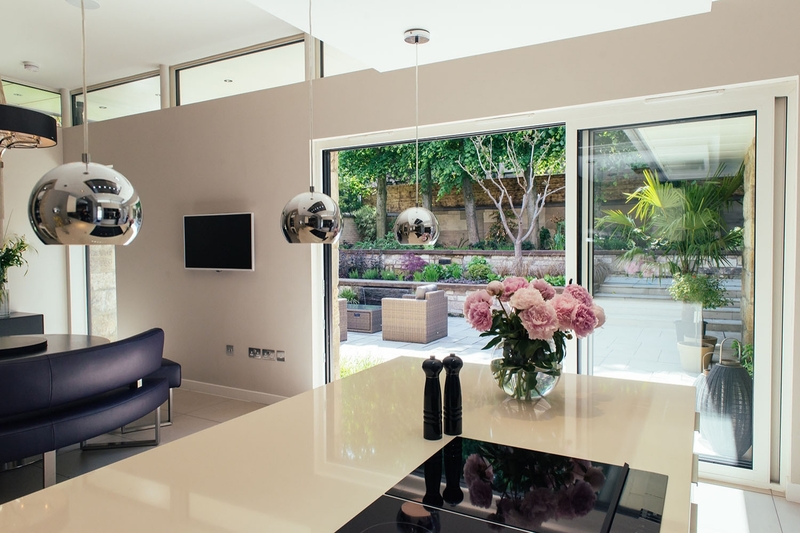 This included the creation of a large extension to the rear of the house to form a new open plan kitchen / dining area with a link corridor to connect the garage which was also to be converted to provide a gym and study. In the food preparation area, which is in the part of the kitchen that connects with the rest of the house, a large Leicht Ceres island was chosen with LED plinth lights. The sink was positioned on this back wall again to keep out of sight of visitors. 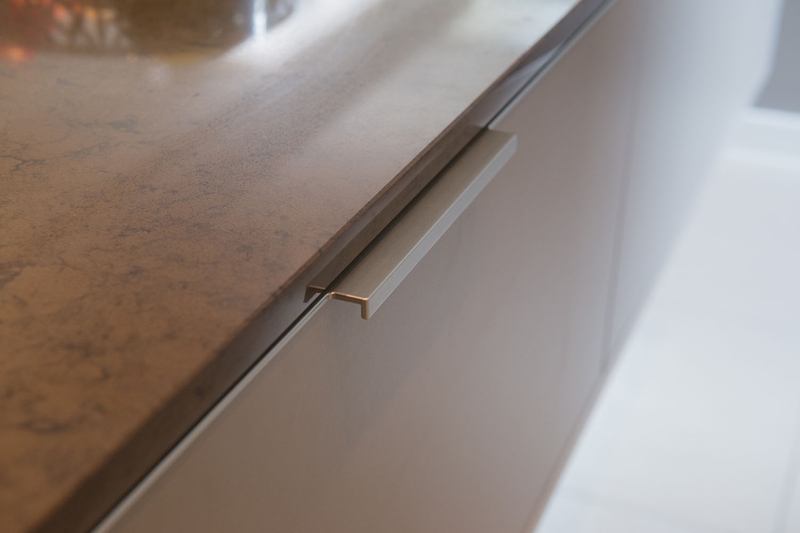 The cooking/hob island was more visible to the living space so a large Leicht Ceres island in matt magnolia with a Silestone worktop in Haiku was designed. A feature was created out of a recess within the original sandstone wall and made into a wine fridge and storage for glasses. With clever lighting this has become a stunning feature and easily accessible from the dining and living area. 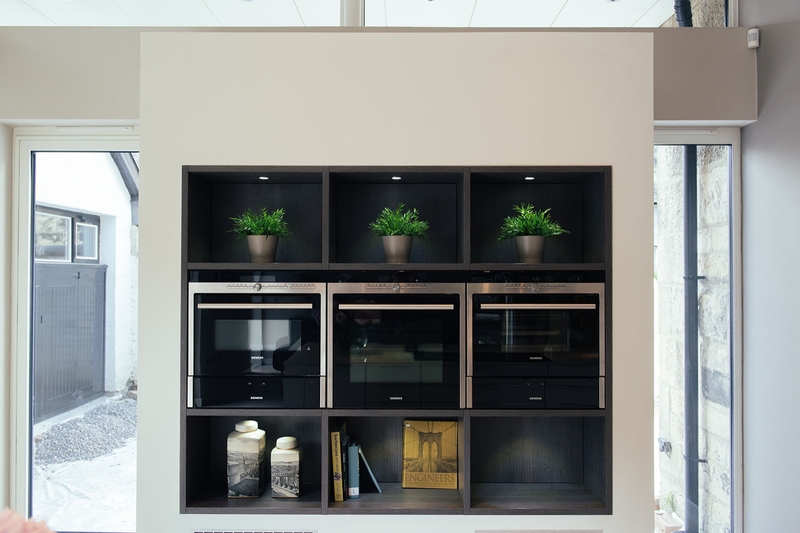 To incorporate all the appliances we installed a bank of Siemens ovens, warming drawers and combi microwave on the wall leading to the garden. This meant they were easily accessible from both the cooking area and the food prep area. 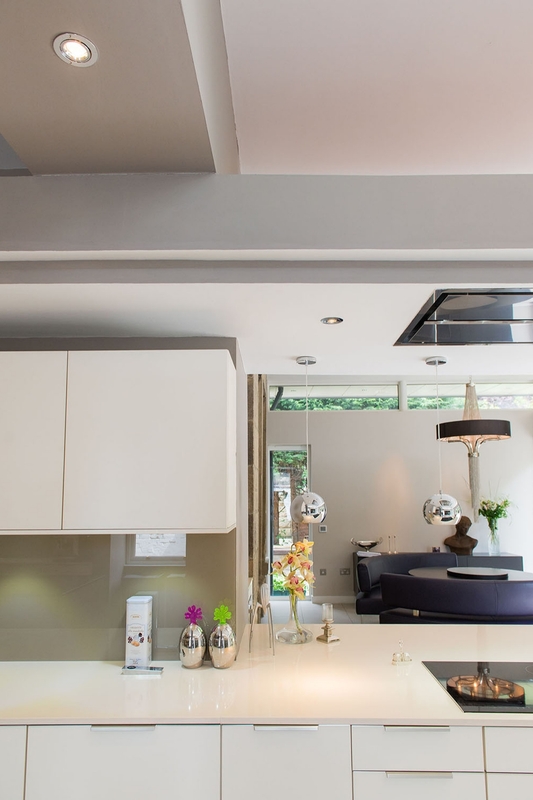 Extraction has been cleverly integrated into the ceiling and stunning lights were added to the breakfast bar. “I am thrilled with the final result. 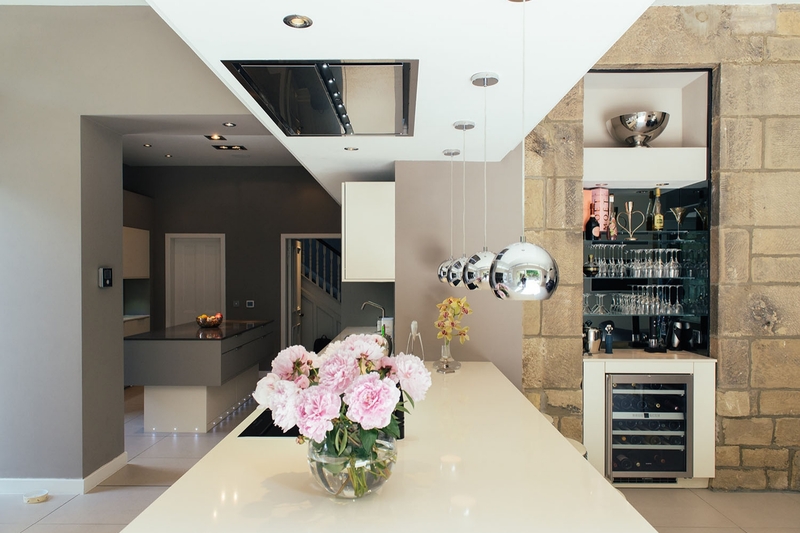 A stunning contemporary kitchen space which looks great from both the garden and within”.